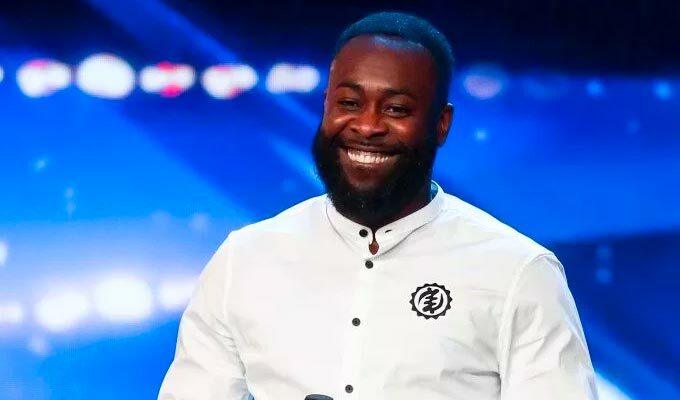 Comedian Kojo Anim has made it through to the Britain's Got Talent semi-finals – after 20 years on the circuit. The 42-year-old got through when head judge Simon Cowell used his golden buzzer to send him through to the next stage on last night's show. Before his routine, Kojo told the audience: 'I've been doing comedy for 20 years. I've spent most of those 20 years encouraging new comedians and helping big-name comedians, opening up for them. Kojo received a standing ovation for his routine about his parent's tough approach to child-rearing, poor service in banks and taking cabs when you're broke. And afterwards the judges were full of praise. And Cowell said: 'I don't really like comedians on this show, but I love you' – before pressing the buzzer that released the golden confetti. The clearly emotional comic fell to the ground after hearing the news. Kojo has previously opened for act such as Kevin Hart and Chris Rock, and runs a London club, Kojo's Comedy Fun House, where Dave Chappelle has roadtested material. The club also had its own spin-off MTV, while in 2005, Kojo also co-presented CBBC show The Mighty Truck Of Stuff alongside Reggie Yates. Here's Kojo's performance on last night's show.